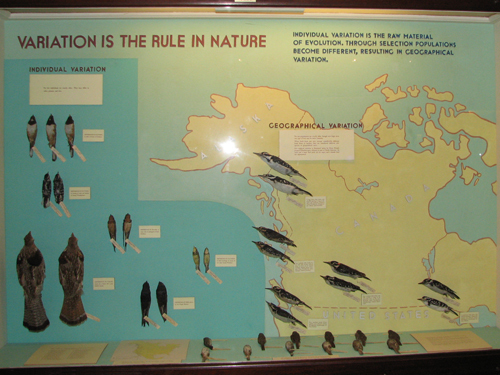 On September 26th we visited the Field Museum in Chicago to attend a free lecture given by the author of The Curse of the Labrador Duck. 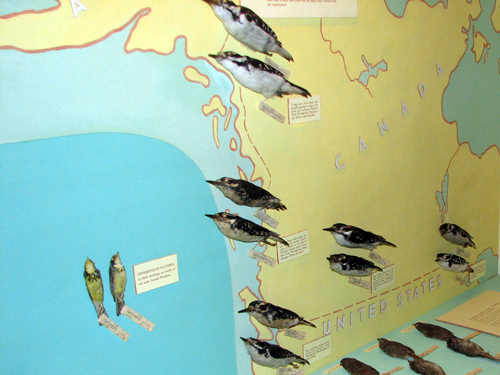 As a gift to the birding community, early registrants of the lecture were allowed free admission to the museum for the day, so we took the day off and arrived early for our first visit to the Field in several years. 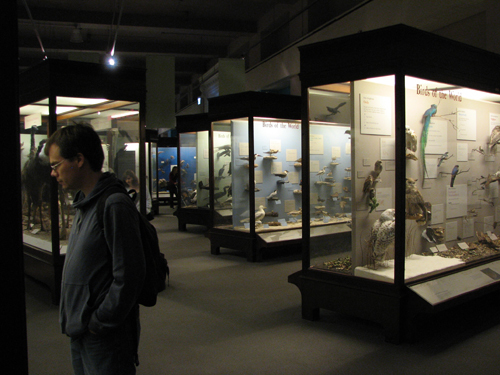 The Stanley Field Hall at the Field Museum. You can see Sue in the foreground. 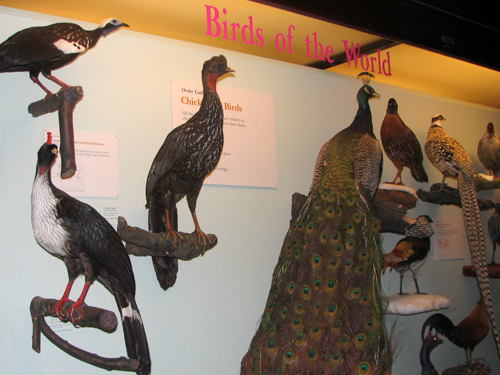 We spent most of our time on the lower level, visiting several of the outstanding wild animal and bird displays, including Bird Habitats, World of Birds, Nature Walk and North American Birds. Here are some of my favorites from the day. 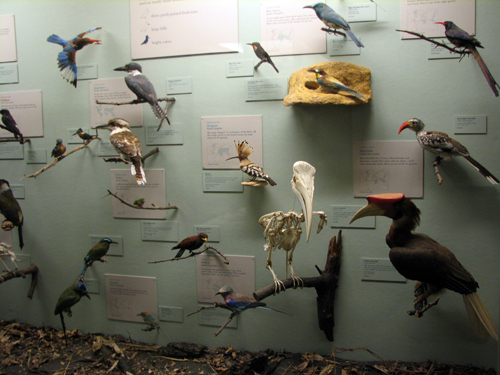 The Montezuma Oropendulas became my new favorites. What a wonderfully-named bird! 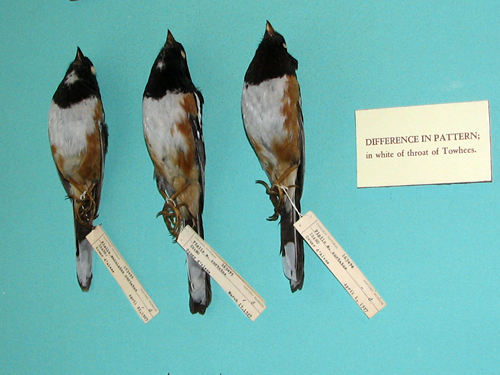 From the accompanying text: “In common with many related species, Oropendulas breed in compact colonies. 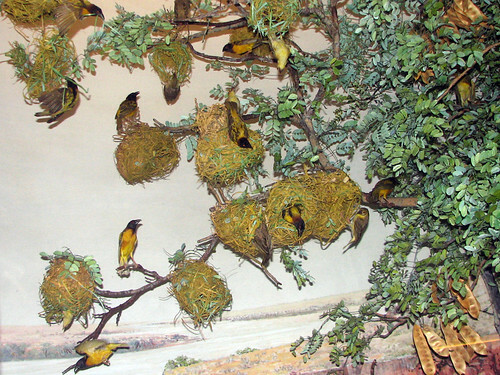 The carefully woven nests of grass are destroyed and entirely re-built each year. Oropendulas are inveterate thieves. 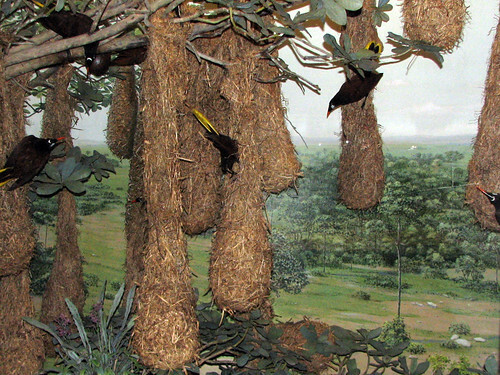 Even the birds of a single colony must guard against robbery of nesting material by their neighbors.” Cheeky. 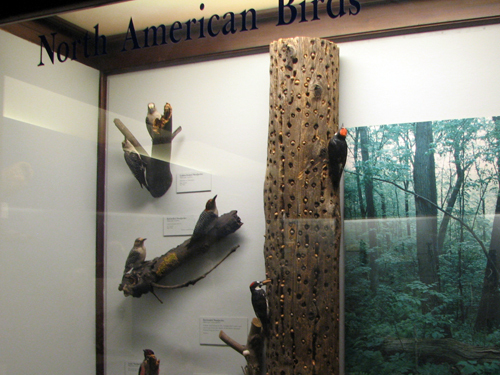 There were also smaller cases showing other bird species in their (sometimes former) habitat. 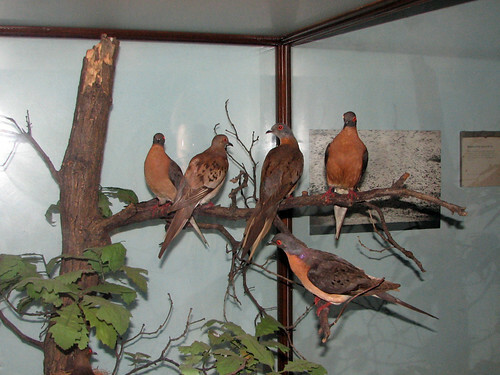 Passenger Pigeons. 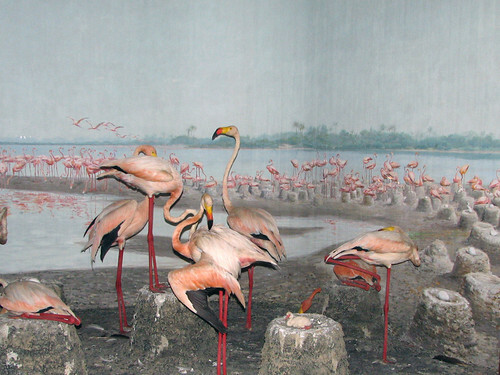 There’s a photo in of a huge flock of these once-abundant birds in the background. 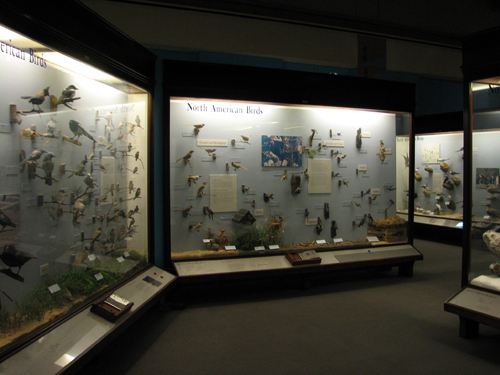 The Field also has cases and cases showing birds of the world as well as a huge selection of the birds found in North America. After visiting the bird and wild animal galleries, we enjoyed Glen Chilton’s Labrador Duck lecture and got our copy of his book signed. 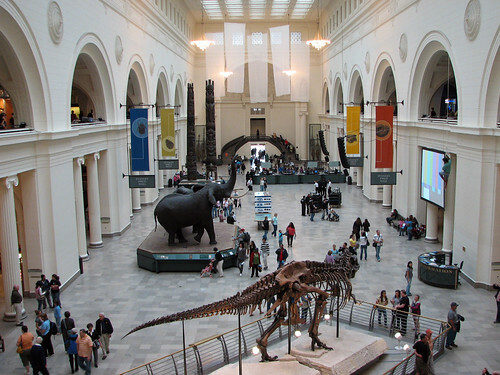 It was a great day out at the Field Museum! 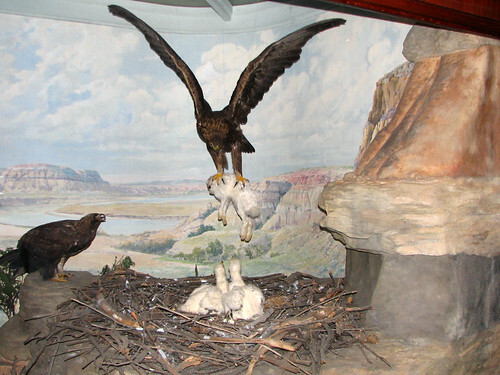 This entry was posted in Illinois, Museum. Bookmark the permalink. 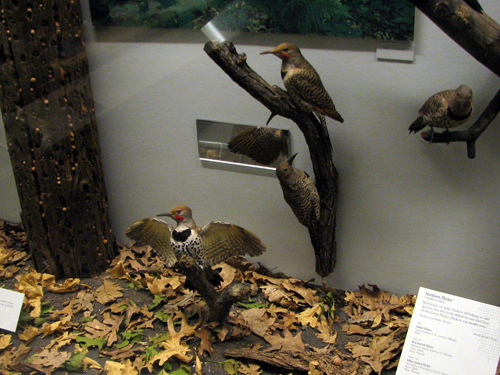 its so much best visit.i love birds.